No need to go out to enjoy this cheesy Hashbrown Casserole. 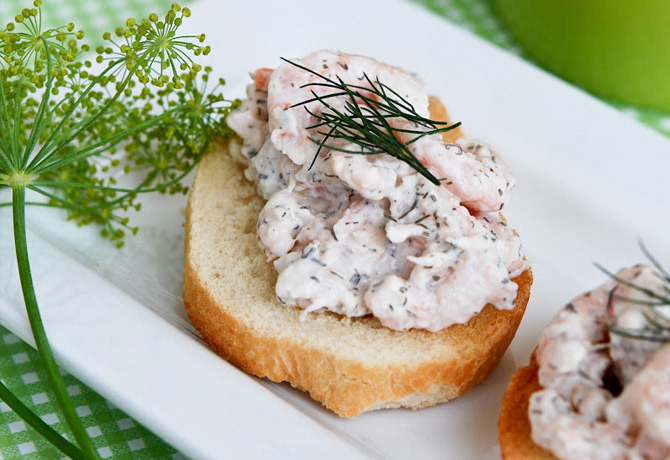 It assembles in minutes, uses few ingredients, and tastes just like the restaurant version! On my list of comfort foods, Hashbrown Casserole is right at the top of my favorites. 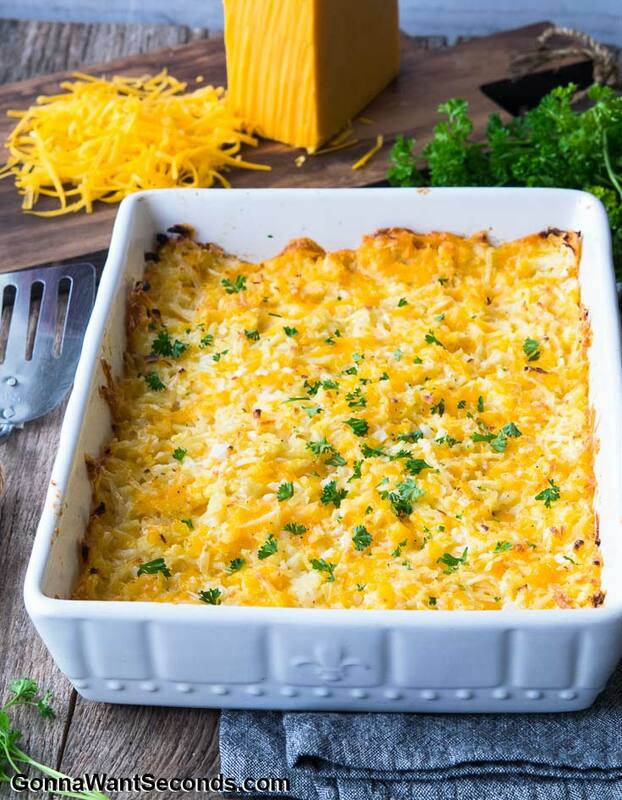 Cheesy and rich, this decadent dish can be more than just a breakfast hashbrown casserole. It’s a delicious side to any meal! I prefer to make my Hashbrown Casserole without sour cream, but, honestly, both versions are fantastic. I’ve seen a couple of recipes for Hashbrown Casserole with cream cheese, but I don’t think this recipe needs any help to make it creamier or more delicious. It’s got the perfect balance of cheese, sauce, and potato! 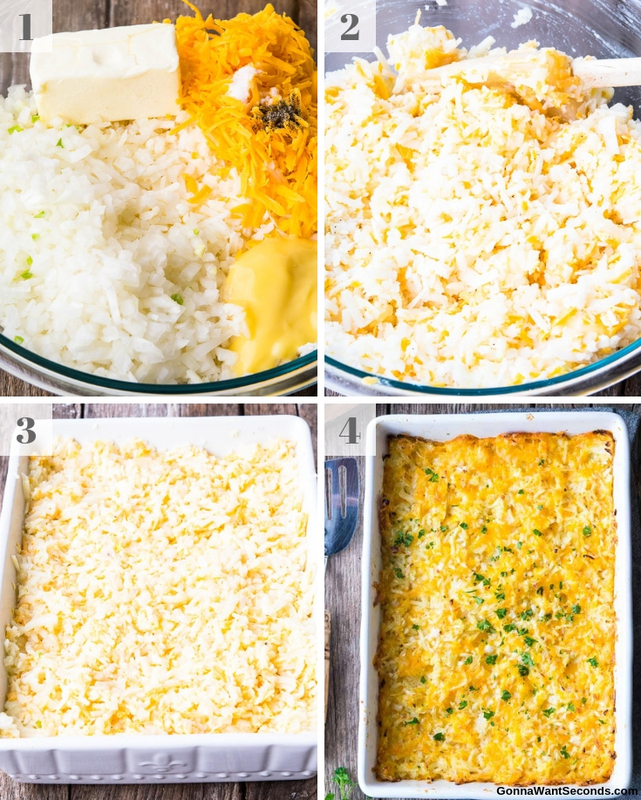 This simple recipe shows you step by step on how to make hashbrown casserole. After preheating the oven and coating a casserole dish with cooking spray, mix all of the ingredients together. Pour into the prepared pan and bake. 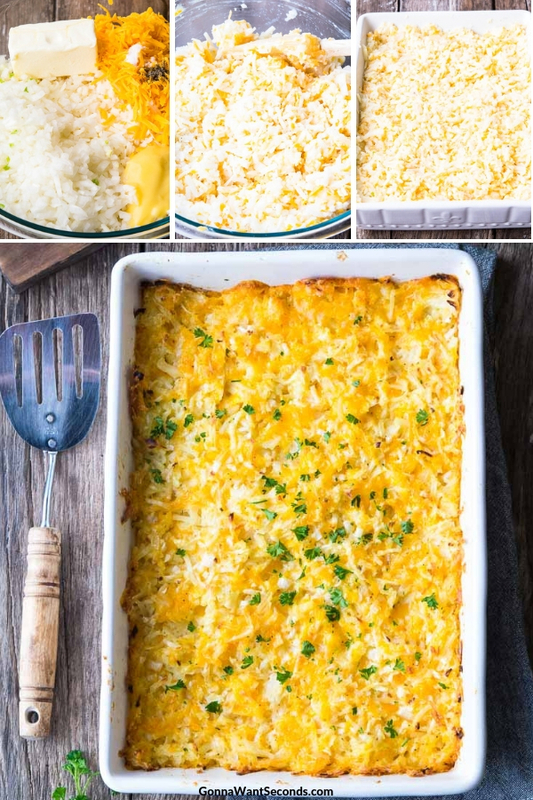 It really couldn’t be simpler to make Hashbrown Casserole! 1. Spray a 9×13 baking dish with non-stick cooking spray. Set aside. Preheat oven to 350 degrees. 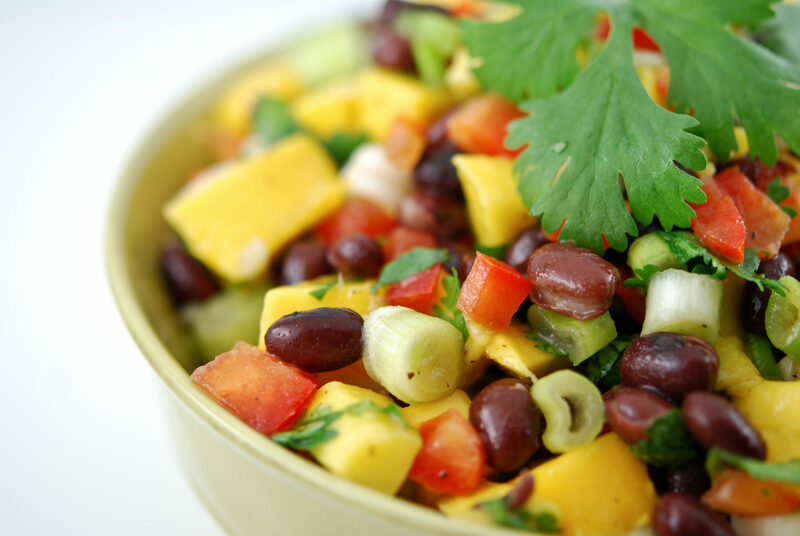 Combine all the ingredients to a large mixing bowl. 2. Gently mix until well combined. 3. Transfer mixture into the prepared baking dish. 4. Bake for 45-50 minutes. Serve. 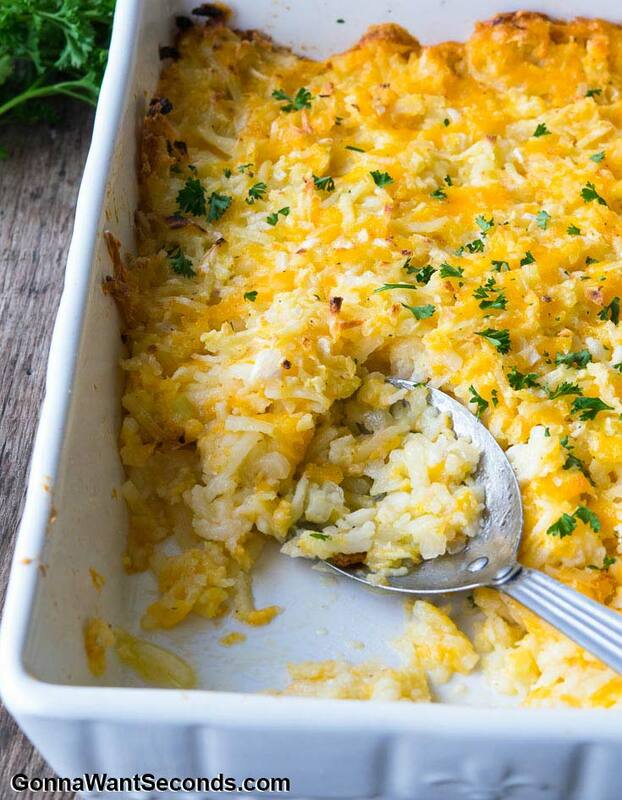 If you want to take this Hashbrown Casserole recipe to the next level, try amping up the cheese factor. You can use a can of cheddar cheese soup or cheese whiz in addition to the rest of the ingredients. You can also add an extra cup or two of your favorite cheese to make your own take on Cheesy Hashbrown Casserole. Consider Monterey or jalapeno jack, smoked gouda, or Munster to add another layer of flavor. You can choose to top you hash brown breakfast casserole in a variety of ways. Let your imagination run wild. Other popular toppings include crushed cornflakes, Ritz crackers, or Panko bread crumbs. Any of these will give you a nice crunch on top. Spray a 9x13 inch pan with non-stick cooking spray and preheat oven to 350 degrees. Combine potatoes, butter, onions, soup, salt, pepper, and cheese in a large bowl. Mix gently until just combined and pour in pan. Bake in preheated oven until browned, about 45-50 minutes. 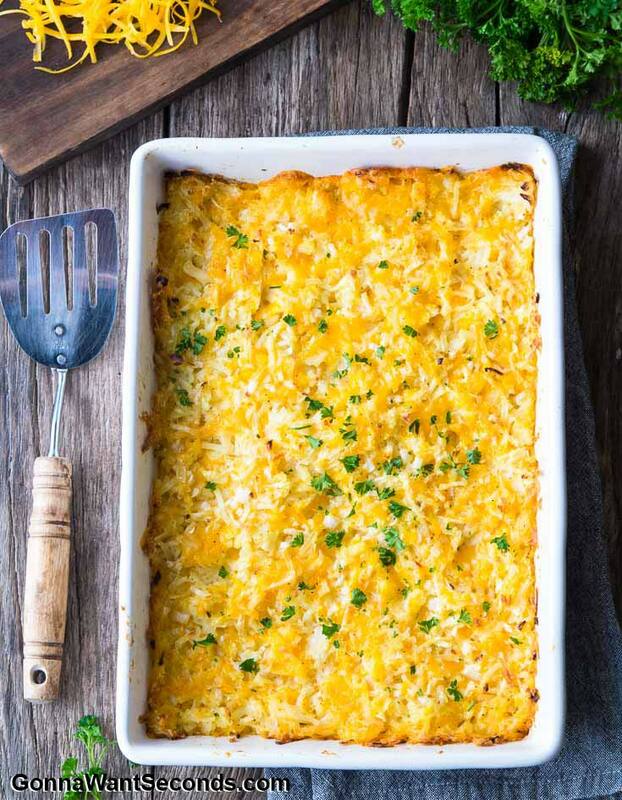 Meat Variation: You can add meat to this hashbrown casserole recipe to make it a complete meal on its own. Use cubed ham to create hashbrown casserole with ham. It’s a perfect way day after holiday meal! Leftover chicken can transform this into chicken hashbrown casserole. Add 1-2 cups of meat to the mixture and prepare as directed. Cutting Onions: Onions can be a pain to deal with, but the flavor they bring to a dish makes it well worth the effort. There are several ways to make chopping onions less obnoxious. Of course, you can always ‘cheat’ and use the food processor! I won’t tell! Hash Brown Options: Hash browns come in all shapes and sizes. 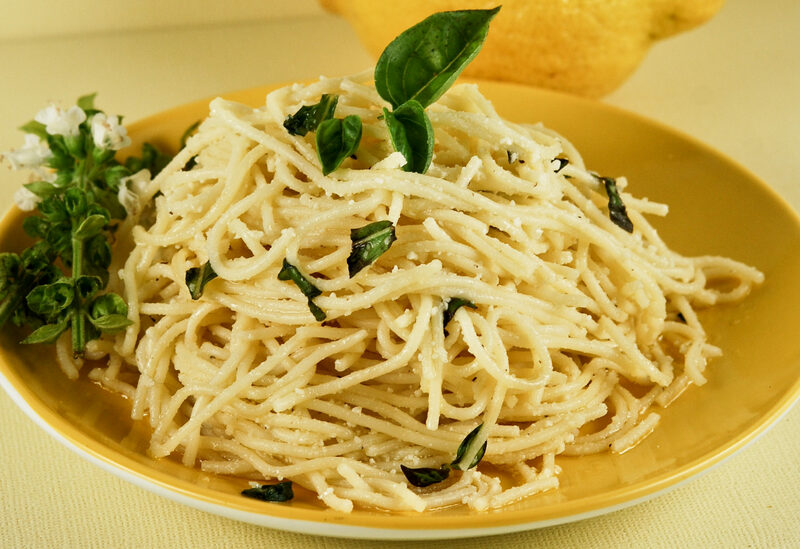 I prefer the shredded ones, but you can experiment with different kinds. You can even try the ones with frozen peppers for an extra kick! The only adjustment you might need to make is cooking slightly longer if the hashbrowns are really chunky! You can also use refrigerated hashbrowns. 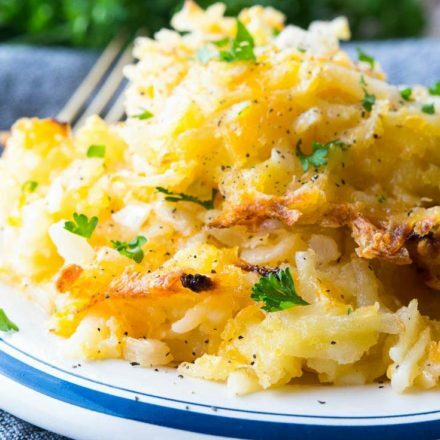 Using Fresh Potatoes: No frozen hashbrowns on hand? No worries. 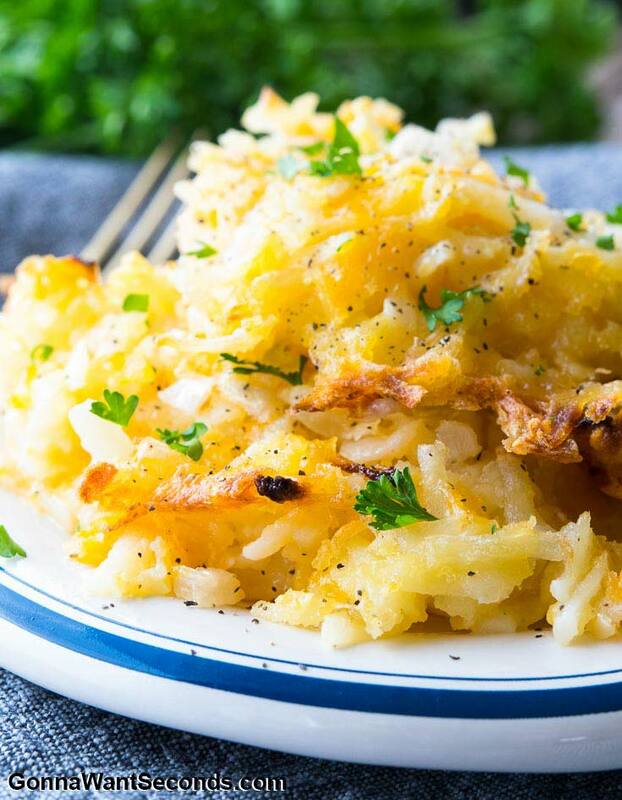 You can use fresh potatoes as well (though frozen hashbrowns are sooo much easier!). The key is to get as much moisture as you can out, so you don’t mess up the consistency of the casserole. Parboil the potatoes whole first. Just drop into boiling water for about five minutes and then transfer to cold water. Once they are cool, grate the potatoes and give them a good rinse. This helps to rinse the excess starch away. Now the key step- dry the potato shreds. A salad spinner works great to get rid of most of the excess moisture. Then, put the shreds in a clean, linen kitchen towel, gather up the edges, and twist until you are squeezing the potatoes. Keep twisting and squeezing until you can’t get any more moisture to come out. Continue to assemble the rest of the recipe as directed. Controlling The Moisture Level: I like this casserole to bind together tightly and have a low moisture level. That’s why I cook it uncovered. It also gives you those crunch bits around edges! However, if you like it more on the saucy side, cover with aluminum foil to trap the moisture. How To Make Hash Browns Ahead Of Time? When considering how to make hash browns ahead of time, remember that this dish assembles in literally five minutes. However, if you need to have it at the ready, you can assemble up to 24 hours in advance, cover, and keep refrigerated. Bake as directed. How To Freeze Cracker Barrel Hashbrown Casserole? If you need to make Cracker Barrel Hashbrown Casserole (or any variation) ahead of time, freezing is a great option. Assemble as directed and freeze in a baking dish. You can bake directly from frozen or allow to thaw before baking. If baking from frozen, allow for additional cooking time. Leftovers- if there are any- freeze well too! Freeze in single servings for a great snack or midweek breakfast! What Do You Serve With Hash Browns? 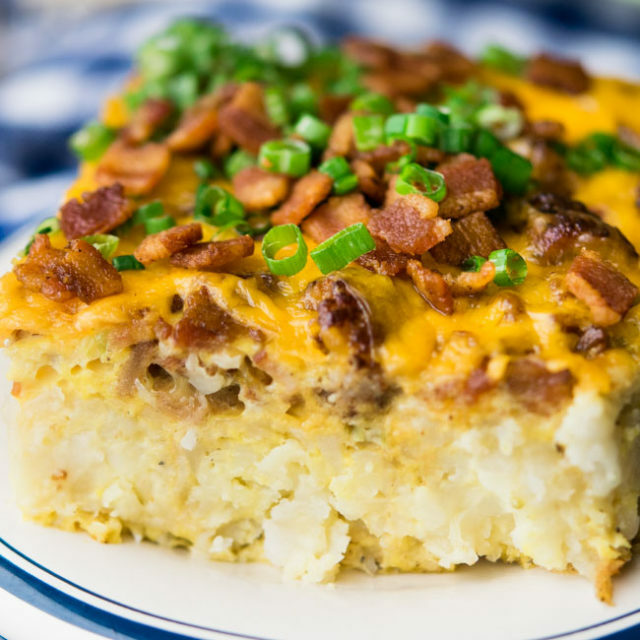 Traditionally served as a hashbrown breakfast casserole, hash browns casserole goes well with any breakfast fare- bacon, sausage, pancakes, eggs… But don’t limit yourself… this is also a great dish for potlucks, Sunday supper, or even as a mid-week dinner side. It goes great with pork chops or chicken! Can You Make Crockpot Hashbrown Casserole? 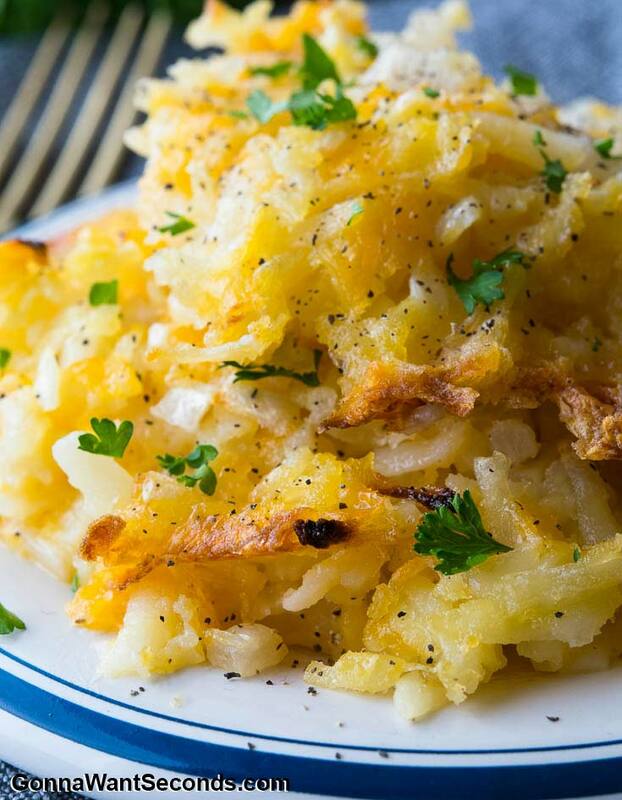 This recipe can convert to Crockpot Hashbrown Casserole without any major adjustments. 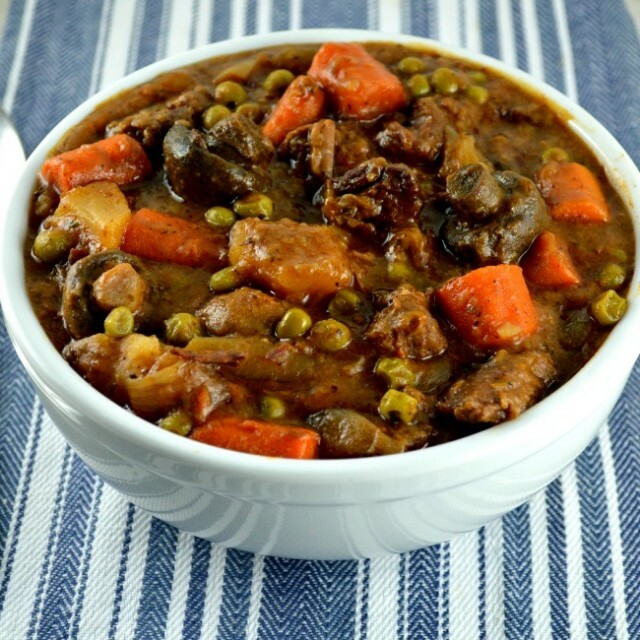 Slowcooker versions tend to retain moisture and are a bit soupier than oven versions. However, it’s a great alternative if you’re short on oven space or want an oven alternative. Simply spray the inside of the crockpot with cooking spray and pour in the mixed ingredients. Cook on high for 4-5 hours. I do love a casserole. My Scalloped Potatoes And Ham takes russet potatoes new cheesy heights in a decadent sauce with a generous helping of cubed ham. 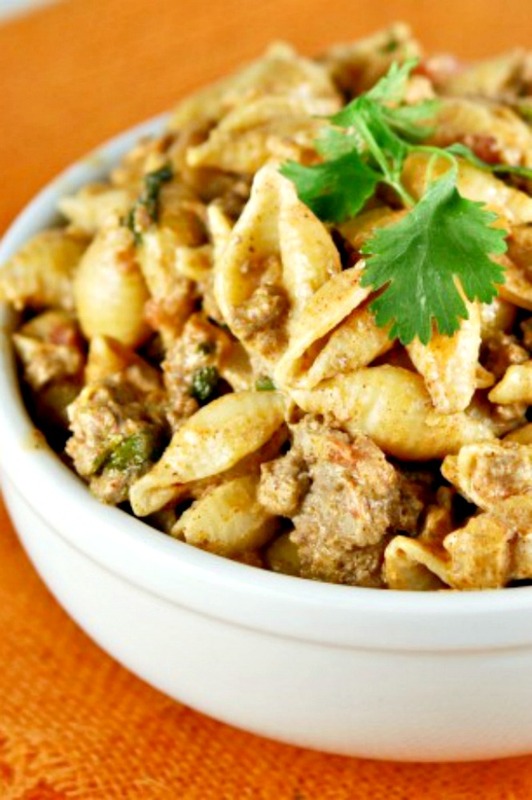 It’s a fantastic supper as well as a great way to use up holiday leftovers! Another one of my favorites is Tater Tot Breakfast Casserole. It’s eggy, cheesy yumminess can be made ahead time and is a family favorite for brunch. 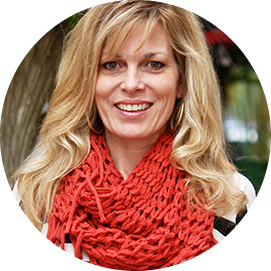 This looks AMAZING Kathleen, and SO easy!!! I have been making this delicious “Cheesy Potato” Casserole for years and it is a family favorite. ….. it is ummexpected to be served at Christmas dinner with our Baked Ham. Yummy for sure ! How many hash browns? I’m reading 12 pound package!!? Hi, Lucrezia, it’s One 2-pound package frozen hashbrown. I added the hyphen. Thanks! I made it for our brunch after Chapel and hoped for leftovers but not a shred left. So twas a huge success. Now I have to make another for us as were at the end of the line and didn’t even get to lick the pan. 🙂 I did use cream of cheddar soup instead and that really put it over the top. Thanks so much for sharing so many wonderful recipes.